My Mom, Billie Lyon, is standing next to me listening to my dad's band and enjoying the fond memories. She was playing bass on this record. I played bass on a couple of the other records. We think that the steel player was Hank Evener, a great peddle steel musician who was blind and played in his later years in and around Flint, MI. Johnny Colmus is still playing music out in Las Vegas and his family may still be playing in the Mt. Pleasant, MI, area. Tracy White was the guitar player, very fast and precise, from Detroit, MI. Lois Ann was from Farwell, MI, as was Johnny Colmus. Lois Ann was a great yodeler and lots of fun, had two daughters, I believe, and last lived in Boyne City, MI. 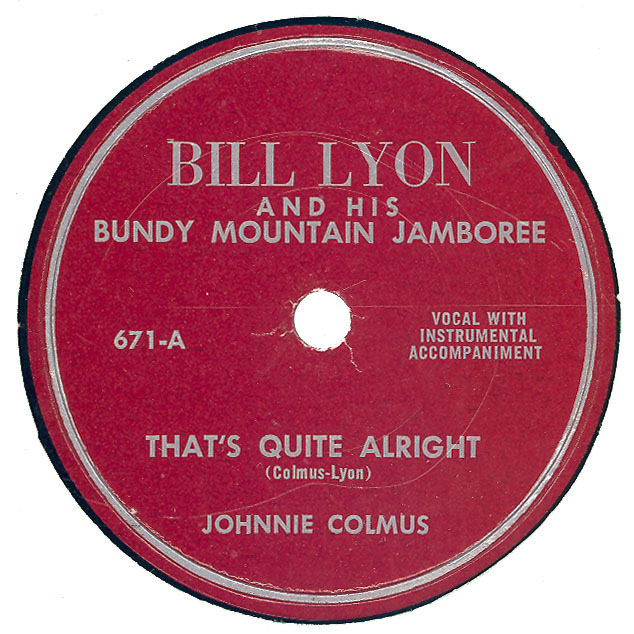 Bill Lyon and the Bundy Mountain Jamboree had a TV show on Thursday evenings on Channel 7, I think, out of Traverse City, MI, from 1954-1961 with an extra 1 hour show on Saturdays in the summers (1958, 1959)shot outdoors on a wagon with cows behind us with cameras on the loading docks at the back of the station. By then, my brother, Butch, was also in the band on drums. Butch later played drums for 17 years in The Playboys (a great 3-piece band)in the Thunder Bowl alleys and night club in Alpena, MI. My name is also Bill Lyon and I live in Palm Coast, FL. You can reach me at Billnflolyon@aol.com. My family used to see the Bundy Mountain Jamboree at a theater in the small town of Remus, Michigan in about 1956-1958. At least once there was a talant show for locals. The steel guitar player was very memorable. I think a DJ named was form a Mount Pleasant radio station.